Model 10OA is a 10,000 lb. 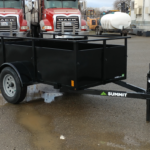 over-the-axle or deck-over trailer that is a full 102″ wide – that maximum width allowed in a trailer. 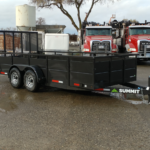 Deck-over trailers are great for hauling pallets of material because without any fenders in the way, you can normally fit two pallets across the width. 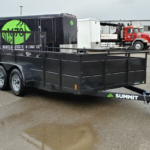 With this unit’s 16ft length, you should easily be able to fit 8 pallets on the deck. With the included 6ft loading ramps, you can easily load and haul tractors and other equipment.